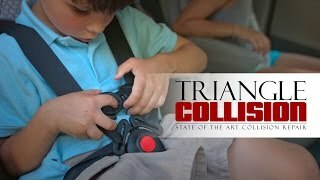 Triangle Collision is a member of the Assured Performance Network. As a Cadillac body shop we can guarantee that your investment will be protected, and the safety and performance features of your Cadillac will be fully restored to pre-accident condition. We understand that your Cadillac is a significant investment, and are confident that you will be satisfied with the quality of our service. We offer Lifetime Warranties for our repairs and paint services. This way you can rest assured that your vehicle will be repaired to pre-accident condition. .
Our mission is to make the repair process as hassle free as possible. We want our customers to know that their vehicle is in good hands, and we will always be transparent throughout the repair. Our technicians will help you to understand the extent of the damages, and how these will need to be repaired. As a GM Recognized Cadillac Body Shop, we always follow the factory guidelines for repair. We also always suggest the use of OEM parts that are guaranteed to fit the complex design of your Cadillac. As a member of the Assured Performance Network, our facility and technicians have been manufacturer approved for restoring their vehicle’s to like-new condition. Our repairs will not only restore your Cadillac’s performance and safety, but also it’s value. Our repairs can even keep factory warranties intact. You and the manufacturer want your Cadillac to drive as well as it was designed to, which is why Cadillac prefers their vehicle is repaired at a GM Recognized Cadillac Body Shop. With our GM recognized tools and technicians will your Cadillac receive an “invisible repair”. Under a critical inspection, there will be no signs that your vehicle was involved in an accident. Not only will your Cadillac be safe to drive, but it will look just as good as it did when it left the dealership. Our technicians have access to BASF technologies, which lead the industry in automotive refinishing. All dents, scratches, and other discolorations will be erased. On the inside and out, there will be no signs of the accident.